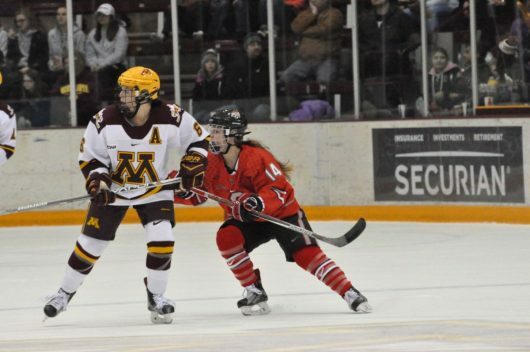 The Ohio State women’s hockey team put up four goals — three back-to-back in the second period — to defeat conference opponent Minnesota State 4-2 on Senior Day. Each of the Buckeye seniors, captain forward Katie Matheny and captain forward Breanne Grant, scored a goal in their swan song at OSU Ice Rink. 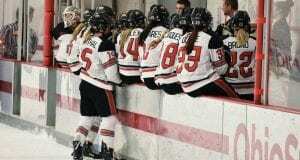 The Buckeyes improved to 12-15-5 overall and 6-15-4 in the Western Collegiate Hockey Association, while the Mavericks fell to 6-22-4 and 3-20-3-1. Also scoring for Ohio State was junior forward Julianna Iafallo, junior defenseman Jessica Dunne and Grant, all within six minutes of play in the second period. Matheny sealed the deal with a breakaway goal in the third. In spite of a scoreless first period, the home team dominated on the ice in the second. At 10:28 in the second period, Iafallo found the net off an assist from Matheny to put the Buckeyes up 1-0. Just a few minutes later at 14:04, Iafallo made an-across-the-ice pass to Dunne, who slapped a one-timer into the net to double the OSU lead. At 15:19, redshirt freshman defenseman Jincy Dunne was called for slashing and the Maverick’s Sara Bustad for holding which sent the two teams to four-on-four play. Shortly after at 16:40, Grant scored her goal off an assist from sophomore defenseman Lauren Boyle. By the end of the second period, OSU led 3-0 and had outshot Minnesota State 26-15. At 8:27 in the third period, Matheny broke away for her score that sent the Buckeyes up 4-0. Shortly after, the Mavericks avoided the shutout with a goal from Steph Keryluk, assisted by Sara Bustad at 11:28. Minnesota State scored one more time at 16:40 thanks to a goal from Hannah Davidson off a pass from Anna Keys. The Mavericks pulled the goalie in the final three minutes and opted for six skaters in hopes of making some offensive moves but were kept at bay by the Buckeye defense. After concluding the regular season home schedule, Ohio State will travel to North Dakota next weekend for two final WCHA contests before the conference tournament.